One of the reasons that digital media seems to stop at the Canadian border is that media companies have signed distribution deals here in Canada that give them exclusive rights to that content. So let’s take a look at what those companies are doing to capitalize on their content. A quick visit to Global TV’s website shows what basically all of the Canadian broadcasters are doing with their content. Whatever is airing on their network is also available online, which to be honest is pretty darn cool. However, the efforts of the Canadian broadcasters fall down when it comes to usability. I don’t want to have my family huddle around a computer screen to watch TV, and even if I did have a computer plugged in to my big-screen TV (which I do), I wouldn’t want to be fishing around on multiple websites with my mouse to find the content that I want to watch. Other problems with the broadcaster’s websites include varying levels of video quality, most leaning towards “unacceptable” and a painfully ineffective attempt at ad insertion. I asked my wife to go through a night watching nothing but web TV from one of these sites, and by the end of the experience she wanted to strangle whoever made the Dove man-hide commercial. After sitting through any ad ten times in a row, the blood does begin to boil. I’m sure that the people who put these sites together are all working hard, but overall the attempt is half-hearted compared to the relative maturity of the US broadcasters. While not perfect (I’ll review some of the US services in a later post), the US sites have made it easier to find your content through aggregation sites, to make HD content available on many mobile and tv-connected devices, and to help ensure that the ads which hit your eyeballs are relevant to you. The product manager in me says stop wasting your money, and partner with some of the US players to leverage their platform and economies of scale while retaining your license and advertising revenue rights. Okay, so enough of the pontification and on to the review against our cutting the cable in Canada ground-rules. For the purposes of this exercise, the Canadian TV Web sites are not a useful alternative for cutting the cable. I have a feeling that they may play a part once I start to look into hybrid solutions, but on their own they just don’t cut it. For reference, here are the Canadian TV websites that you can leverage for content (if I’ve missed any good ones, let me know in the comments). you might want to try the boxee box (http://www.dlink.ca/boxee/) for your experiment. i’ve been quite impressed it, particularly how, after you tell it which shows are your favourite, it will provide a link to the latest available episodes whether they’re files on your local network or on network websites. 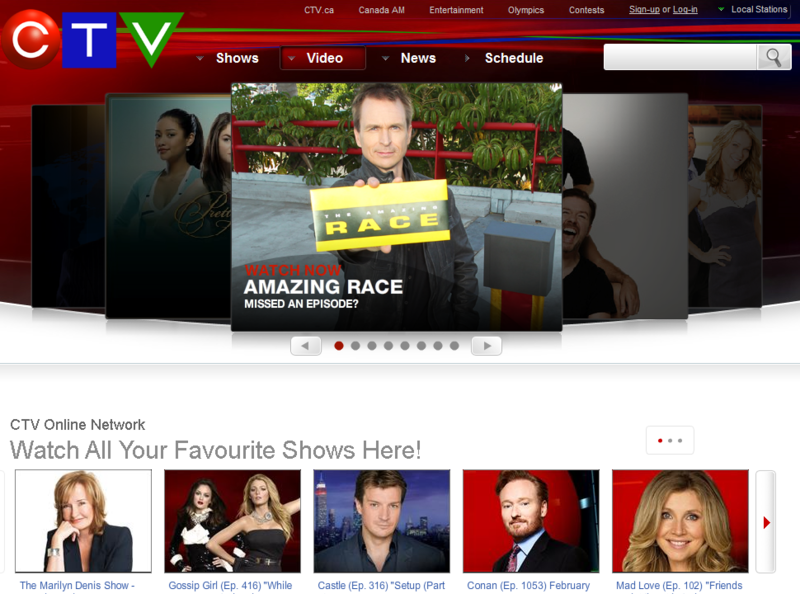 so far i’ve found that citytv’s site offers great looking content, even on a 40″ tv. ctv’s content is ok and globaltv’s is lacking, but all in all, it’s a treat to see new episodes appear even if i’ve forgotten to download them. it’s not perfect, but with the recent addition of netflix, i have no need to use any other device as a source for video. enjoy! Jeff: Thanks for the contribution! Indeed I am also evaluating Boxee and will write about that shortly. Pete: my pleasure. can’t wait to read your review. Brian: if you consume even a moderate amount of content i’d say go for it. at home we have an Xbox 360 and a Wii along with Boxee, and these days i’m just using the Xbox for gaming (the Wii is turned on occasionally for the latest Donkey Kong Country game). Boxee handles media from multiple sources quite elegantly: you can attached up to two USB devices and have it regularly scan hard drives on your network (it has built-in wifi and an ethernet port). the great thing is all your content shows up in the same place, along with any available online content. for example, if you have a bunch of seasons of a show on a drive attached directly to Boxee and you download the most recent episode to your laptop’s hard drive, ALL the episodes will show up in the same place on boxee under that show’s listing. regardless of whether you downloaded the most recent episode, if it’s available online you’ll ALSO have the option of streaming the show from the network’s website. this means you can choose to play the local file or stream the online version. it’s all quite seamless, though as i said above, it’s not without some bugs and annoyances. since i’ve had it, it’s been updated several times, and each time the updates brought significant improvements. you might think i’m an employee based on my enthusiasm but i’m really just a huge fan. let me know how you like it if you get one (i’m @jeffscott on twitter). Good point. Me neither. As I mentioned in an earlier approach, I’m simply using Windows Explorer as my interface. No doubt, that would make most people gag, but one thing I like about doing it that way is that it allows me in most instances to directly bookmark the shows I want to watch from content provider’s website so that we have direct access to a library comprised entirely of shows my family wants to watch. I change the default icons to dress things up a little, but that’s it. Since we still have satellite TV at this point, my wife hasn’t watched much online content, but my kids have, and they defenitely experienced this burnout. What surprises me is that there appears to be very little attempt to tailor the ads for specific audiences. My kids probably aren’t going to be buying car insurance any time soon, but that’s what they have to sit through while watching their Yu-Gi-Oh cartoons. And sit thorough again. And again. And again. Ad naesuem. Strange. OTA HD integration into Windows Media Centre has pretty much resolved my issues with network TV but there are times when we have to minimize WMC and fire up the sites for a show that we forgot to record. It would be great to see the Canadian online content integrated into WMC the way they’ve done it with CBS. I’m sure they are a few hacks out there to get this to work, but I doubt the WAF (Wife Acceptance Factor) would be too high. I am looking forward to the review of Boxee. Where will you watch the hockey games? That’s the important thing!